Keen readers of our blog will have followed our updates on the latest round of improvements to Collideoscope, a joint project with Merseyside Road Safety Partnership. After putting quite a bit of thought into wording across the site, we hope that Collideoscope’s two aims are a lot more prominent throughout. These are to collect data on cycling incidents, and to make that data available to those who need it. This double aim is something that many mySociety sites have in common: they need to cater for people who want to make a report, and people who can make use of the data that those reports generate. Let’s look at how our recent changes meet the needs of each of these audiences. Collideoscope is based on the same software as FixMyStreet, but unlike our street fault site it doesn’t send your report with the expectation that it will be ‘fixed’. Just like FixMyStreet, your report is immediately published on the Collideoscope website for anyone to see. It becomes part of the database of incidents that is available for researchers, campaigners etc, to draw upon. At the same time, a copy of the report is also sent to your council, but this is to feed into their understanding of dangerous hotspots in their area, rather than with any expectation that they’ll respond. Of course, there are certain types of incident which should always, by law, be reported to the police. These include those where there’s any injury or damage to property. Now, we don’t want anyone to think that Collideoscope is an alternative to making a police report. At one point, we considered adding functionality that would allow you to additionally send your report off to the police, but we found that this would be a monumental task, far above the resources we have for this phase of the project. Sadly, there’s no standard across the UK that we could plug into: no common set of questions to be answered, no common place for the information to be sent. Plus, the (paper!) police reporting forms are really long — they aim to gather everything that would be needed, should the case go to court. We didn’t think recreating those forms online would help anyone – not least because the police would, in all probability, just ask the reporter to redo it all on a paper form. At this point in time, it seems the police are far more geared up to reports being made by phone or in person. So with all this in mind, we’ve ensured that when a user makes a report that meets the required degree of severity, they’re prompted to also let the police know. Because we have the postcode of the spot where the incident happened, we’re able to give the user a link to the correct police force for the area, and so as not to divert the task in hand, we do this once the Collideoscope report is confirmed. 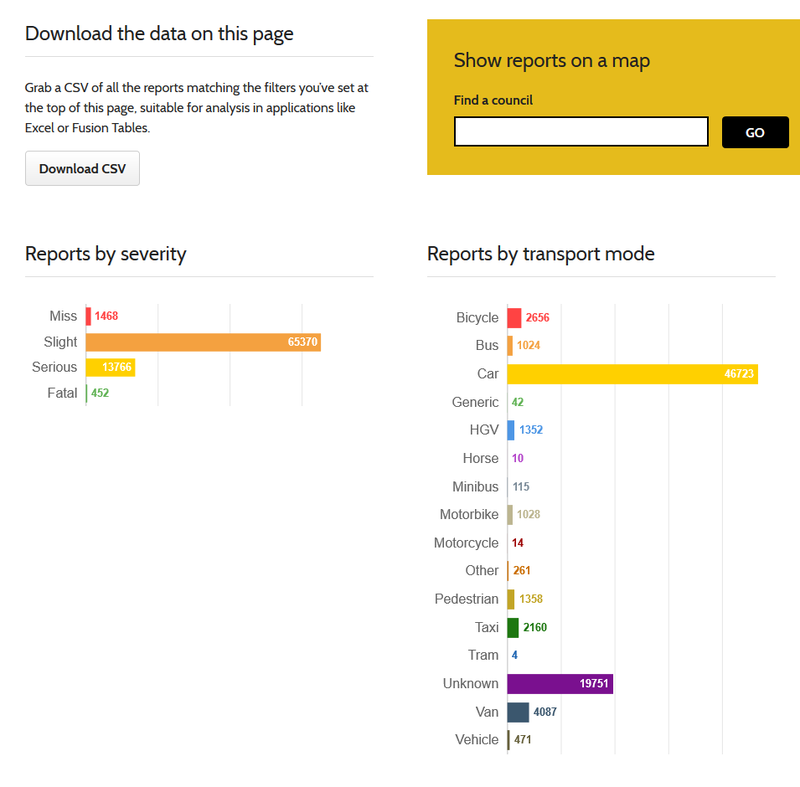 Users making any type of report will also see a link through which they can find their local cycling campaign group, in case they want to get proactive about improving road safety. There are a number of ways to access the data on Collideoscope. As with FixMyStreet, you can view any neighbourhood by inputting the postcode or place name in the search box on the homepage (or asking it to automatically geolocate you). 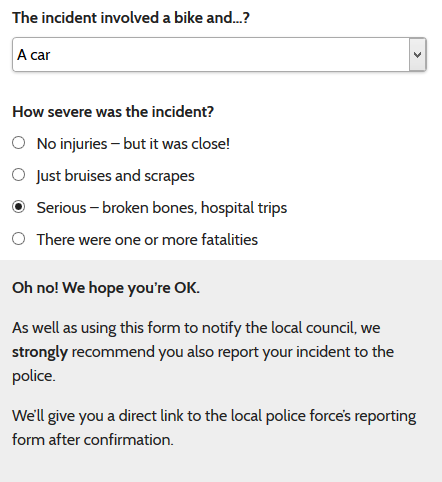 You’ll then see all the incidents reported in the area, with the option to include police reports (England only). But Collideoscope also has a new feature that makes it easier to understand the density of reports: you’ll notice that some of the roads appear in varying shades of orange. The deeper the colour, the more reports have been made on that street — and if you’re a cyclist yourself, you’ll know at a glance where you need to be extra careful. So now you can check out your route and know where to take the most care. (If you find this feature distracting, just look for the ‘hide heatmap’ button at the bottom right of the screen). We’ve introduced a nifty new reports page, from which you can see how many reports have been made, either on a council-by-council basis or for the whole of the UK. Once you’ve picked your council, you can break it down even further, by ward. There’s the additional option to view graphs grouping incidents by severity and by the other vehicle (if any) that was involved. This data can be downloaded in CSV form, for anyone who might need it to support planning decisions, research or campaigns. We hope you’ll go and have a click around the refreshed Collideoscope — and remember it’s there should you be unfortunate enough to get into a cycling scrape in the future. If you do, at least you’ll know that your data is contributing to a good cause. Will you use this data? As we’ve described, it’s now very easy for you to self-serve Collideoscope’s data, but all the same, we’d love to hear how you’ll be using it. Drop us a line! We can also help with any technical questions you may have.